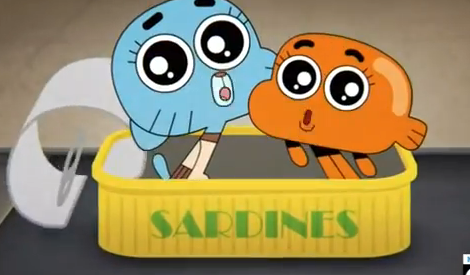 Gumball and Darwin out of a tuna can. gumball and darwin out of a tuna can. Wallpaper and background images in the The Amazing World of Gumball club tagged: the amazing world of gumball gumball darwin season 1. This The Amazing World of Gumball photo contains ڈاؤن لوڈ ہونے والے, مزاحیہ کتاب, منگا, کارٹون, ہالی ووڈ, and کامک بُک. aww very cute and funny!!! It's A Sardine Can!Not A Tuna Can!And It's Not Qute!